Fars Province (/fɑːrs/; Persian: استان فارس‎, Ostān-e Fārs, pronounced [ˈfɒː(ɾ)s]) also known as Pars (Persian: پارس, Pārs) or Persia in the Greek sources in historical context, is one of the thirty-one provinces of Iran and known as the cultural capital of the country. 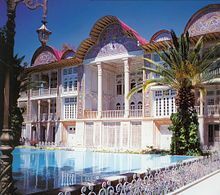 It is in the south of the country, in Iran's Region 2, and its administrative center is Shiraz. It has an area of 122,400 km². In 2011, this province had a population of 4.6 million people, of which 67.6% were registered as urban dwellers (urban/suburbs), 32.1% villagers (small town/rural), and 0.3% nomad tribes. 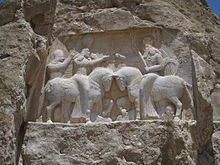 The etymology of the word Persian (From Latin Persia, from Ancient Greek Περσίς (Persis)), found in many ancient names associated with Iran, is derived from the historical importance of this region. Fars Province is the original homeland of the Persian people. The Persian word Fârs (فارس) is the Arabized form of the earlier form Pârs (پارس), which is in turn derived from Pârsâ (𐎱𐎠𐎼𐎿), the Old Persian name for the Persis region. The Achaemenid Empire was defeated by Alexander the Great in 333 BC, incorporating most of their vast empire. Shortly after this the Seleucid Empire was established. However it never extended its power in Fars beyond the main trade routes, and by the reign of Antiochus I or possibly later Persis emerged as an independent state that minted its own coins. The Seleucid Empire was subsequently defeated by the Parthians in 238 BC, but by 205 BC, the Seleucid king Antiochus III had extended his authority into Persis and it ceased to be an independent state. Babak was the ruler of a small town called Kheir. Babak's efforts in gaining local power at the time escaped the attention of Artabanus IV, the Parthian Arsacid Emperor of the time. Babak and his eldest son Shapur I managed to expand their power over all of Persis. The geographical and climatic variation of the province causes varieties of plants; consequently, variation of wildlife has been formed in the province. Additional to the native animals of the province, many kinds of birds migrate to the province every year. Many kinds of ducks, storks and swallows migrate to this province in an annual parade. The main native animals of the province are gazelle, deer, mountain wild goat, ram, ewe and many kinds of birds. In the past, like in Khuzestan Plain, the Persian lion had occurred here. Agriculture is of great importance in Fars. The major products include cereal (wheat and barley), citrus fruits, dates, sugar beets and cotton. Fars has major petrochemical facilities, along with an oil refinery, a factory for producing tires, a large electronics industry, and a sugar mill. Tourism is also a large industry in the province. UNESCO has designated an area in the province, called Arzhan (known as Dasht e Arjan) as a biosphere reserve. Shiraz, provincial capital of Fars, is the namesake of Shirazi wine. A large number of wine factories existed in the city. Shiraz Airport is the main international airport of the province and the second in the country. The cities of Jahrom, Lar and Lamerd also have airports linking them with Shiraz and Tehran and nearby Persian Gulf countries such as the UAE and Bahrain. Shiraz is along the main route from Tehran to southern Iran. Mansur Hallaj Persian mystic, killed in the 9th century AD. Hafez Shirazi, poet, born and died in Shiraz. Ibn Muqaffa, or Ruzbeh Dadwayh, Persian writer and translator from the 8th century AD. ^ "پرتال سازمان ميراث فرهنگي، صنایع دستی و گردشگري > استانها > فارس > آداب و رسوم". 11 January 2012. Archived from the original on 11 January 2012. ^ Sykes, Percy (1921). A History of Persia. London: Macmillan and Company. p. 43. ^ "National Population and Housing Census, 2011". ^ M. A. Dandamaev (1989). A Political History of the Achaemenid Empire. BRILL. pp. 4–6. ^ Austin, Peter (1 January 2008). "One Thousand Languages: Living, Endangered, and Lost". University of California Press – via Google Books. ^ کشور, پورتال سازمان هواشناسی. "اقلیم استان فارس". www.irimo.ir. ^ a b "Iran fars-shiraz". www.irantour.org. ^ P. Oberling, "FĀRS vii. Ethnography", Encyclopaedia Iranica> "FĀRS vii. Ethnography". 31 May 2014. ^ Various scholars/contributors (2013). Issues in Discovery, Experimental, and Laboratory Medicine: 2013 Edition. Scholarly Editions. pp. 139–40. W. Barthold (1984). "Fars". An Historical Geography of Iran. Translated by Svat Soucek. Princeton University Press. pp. 148–168. ISBN 978-1-4008-5322-9.